I was born in Coatesville, Pennsylvania on February 28, 1945. My first recollection of ham radio was hearing an "old guy" from my church — Tim, W3VOP (SK) — talking to one of my friends about the Morse code. At the time, I didn't pay much attention. However, in 1958, when I was thirteen years old, I had a seventh-grade classmate who kept bugging me about coming to his place. He wanted to take me to a neighbor's house so we could watch this guy "talk on his ham radio to people all over the world!" Finally, out of curiosity, I accompanied my buddy to Les, W3JQY's (SK) shack. Wow! I stood by, fascinated, while Les, with his plate-modulated 100 watt Johnson transmitter talked to a guy in Australia, then some place in South America, and then, who knows? I didn't know 10 Meters from 6 Meters, I just knew I was overwhelmed by the "wallpaper" (QSL cards) covering the walls and ceiling of his shack! Needless to say, the ham radio bug had me completely smitten! I spent the next year scrounging all the scrapped TVs and radios the neighbors could offer, merrily clipping and unsoldering components, beginning my junk box. With the patience and encouragement of W3VOP and W3JQY, I somehow managed to stumble my way through elementary electronics theory, learned a very halting version of the code, and eventually passed the Novice test. My first callsign was KN3LKM. The early months of ham radio for me were a real struggle. As poor a church mouse, I couldn't afford to purchase much of anything new, so I resorted to scrounging. With W3VOP's help, I built my first transmitter, a 6V6 oscillator-buffer, link coupled through a series-fed tuner to a open wire fed 3-folded 40M dipole. For a receiver, Tim helped me convert a WWII miltary surplus BC-454 to 2-band use, for 80M and 40M. I only had one crystal (7147 kHz) but I thought I was king! Alas, in spite of my effort and enthusiasm, I simply couldn't work anyone. Night after night I called endless CQs — faithfully recording every blip of air time in my log! I called my fool head off! I answered every CQ I heard within 2 or 3 kHz. of my 7147 crystal! Nothing! Nada! Nyet! After figuring out that the 6 Watts from my one-tube wonder wasn't cutting it, I saved every nickel I could find and bought a used DX-20. Wow! Twenty whole Watts! Actually that made all the difference. After 6 months of being denied, on November 25, 1960, I made my first QSO! This card is well-preserved, complete with thumbtack holes, and dried-out Scotch tape residue! Thus began what was to be a many, many thousand QSO career spread over the next 50+ years. 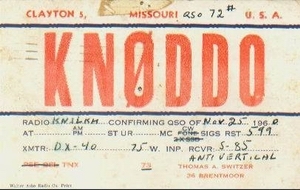 Prior callsigns were K3LKM – PA, K4CXU – VA, and W9KGW – IN.